Yesterday Mikio Hara committed a new package for ipv4 handling to the go.net repository. I wanted to recognise Mikio’s work for two reasons. The level of detail and control this package offers is, in my opinion, unmatched by any other language. If you’re using C or C++, then you have the raw power of setsockopt(2) and ioctl(2) available, but you also have no guide or safety rail when using them. Mikio’s package provides exquisite control over ipv4 minutia without sacrificing the safety that Go provides. The package is a fantastic example of using conditional compilation and embedding to build a very low level package that works across all the supported Go platforms. This package compiles cleanly on Linux, *BSD, OS X and Windows without resorting to the lowest common denominator or using a single ifdef. If you are looking for examples on how to structure your code using build tags, or looking for ways to work within the Go1 API, you should study this package. Check it out for yourselves, go.pkgdoc.org/code.google.com/p/go.net/ipv4. This entry was posted in Go and tagged go, go-golang, golang, ipv4, networking on September 27, 2012 by Dave Cheney. The Raspberry Pi has captured the imagination of hackers and makers alike. While it certainly wasn’t the first ARM development board on the market, its bargin basement price tag and the charitable philosophy of its inventors has sparked a huge interest in this little ARM system. What could be more appropriate for a new generation of programmers than a modern, safe and efficient programming language for their projects, Google Go. This post describes the steps for installing Google Go from source on the Raspberry Pi. At the time of this post, trunk contains many improvements for ARM processors, including full support for cgo, which are not available in Go 1.0.x. It is expected that these enhancements will be available when Go 1.1 ships next year. If you are reading this post in September 2013, then it’s likely you will want to use the version of Go shipping with your operating system distribution rather than these instructions. Update May, 2013 If you want to save yourself some time, precompiled binary releases of Go 1.1 for linux/arm are available. Please see the Unofficial ARM tarballs link at the top of the page. The downloads page on the Raspberry Pi website contains links to SD card images for various Linux distributions. 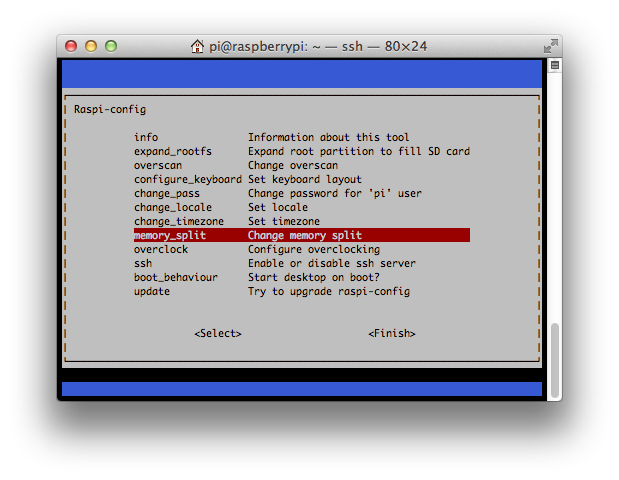 This tutorial recommends the Raspbian wheezy flavour of Debian. 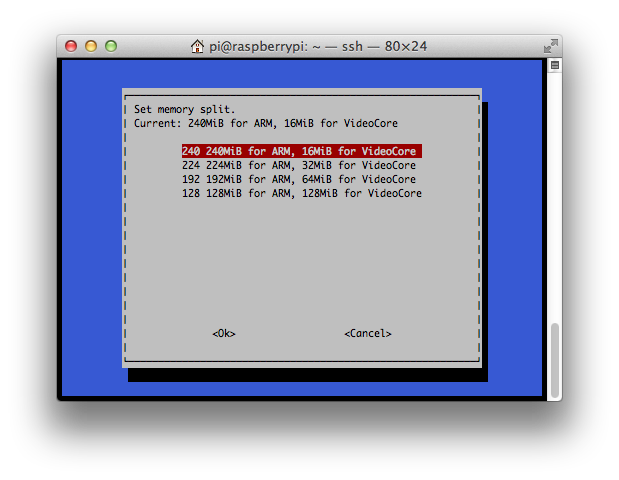 Follow the instructions for creating an SD card image and continue to the next step once you have ssh’d into your Raspbian installation. To run the full test suite you will need some swap. This can be accomplished a variety of ways, using an external USB hard drive, or swapping over NFS. I’ll describe how to setup a NFS swap partition as this is the configuration I am using to generate this tutorial. Raspbian comes with almost all the tools you need to compile Go already installed, but to be sure you should install the following packages, described on the golang.org website. as an alternative to ./all.bash. Now, Go and make something awesome. This entry was posted in Go and tagged go, go-golang-raspberrypi, golang, raspberrypi on September 25, 2012 by Dave Cheney. Hello. Thanks for reading this article. Now that Go 1.1 has been released an updated version of this article is available. Whoa there! This article is out of date. The release of Go 1.5 has invalidated everything below and you really should read this article instead. Support for building a version of Go suitable for cross compilation is built into the Go build scripts; just set the GOOS, GOARCH, CGO_ENABLED and possibly GOARM correctly and invoke ./make.bash in go/src. Therefore, what follows is provided simply for convenience. This will compile the Go runtime and standard library for each platform. You can see these packages if you look in $(go env GOROOT)/pkg. This entry was posted in Go on September 8, 2012 by Dave Cheney. Several weeks ago Steven Degutis posted the slides (1, 2) from his excellent presentation, The quest for the perfect programming language. In reading his slides I was reminded of a blog post made back in 2007 by Steve Yegge called The Next Big Language. 2007 was a different time for languages. While Java held the popular crown, the mainstream programming community were still coming to terms with Java 6. Released 3 months earlier, it was very much an evolution of the Java 5 watershed. Its arrival heralded the end of life for Java 1.4 and represented an opportunity to draw a line in the sand for a Java that assumed Generics and Annotation Processing. In turn this created an opening for alternate JVM languages like Groovy, JRuby and Scala, raising the discussion to a din and giving developers pause to consider a wider field of alternatives. At the time, Yegge left me with the impression that D was his pick for the Next Big Language, although he suggested that the Next Big Language was not amongst the set on the market at that time. This fit my world view as I had just discovered D and felt chuffed to be on the inside track of this up and coming language. D had everything that opened and shut; template metaprogramming, fast compilation, function literals, C like syntax and a memory model that someone coming from Java could grok. Two years later however, D was still stuck in 2007. This was in part due to the infighting between the standard library camps who had failed to learn from the mistakes of the Java class library and were busily adding bloat and verbosity to Phobos and Tango. Similarly those who wanted to hack on the language were bifurcated by the closed source DMD compiler and the slow moving gdc frontend. D may have been an excellent choice for those who wanted a better C++, but it wasn’t clear if actually was a market for a better C++. At this same point in 2007, Rob Pike and Robert Griesemer were sitting, probably not far away from my office at the time, thinking the same thing. It took two years, and the addition of stalwarts like Ken Thompson, Russ Cox and Ian Lance Taylor for their creation to reach fruition; and several more years for their new language to gain mainstream awareness. Therefore, with the benefit of hindsight that history provides, I would like to revisit the major points of Yegge’s Next Big Language, and address them in the context of Go. Update: Go is licenced under a BSD like licence, not the MIT licence. Thanks to the astute readers on HN for noticing my mistake. Update 2: The names of the D standard libraries are Phobos and Tango. I have also updated the list in rule 5 to be a table at the request by request. The NBL does not replace C++, the NBL is garbage collected. As Yegge said at the time, there will always be a bunch of engineers who think that’s evil, and they’ll continue to use C++. I think the experiences of D have borne that out, but more importantly there is a lesson to be learnt that there is no one single language that is appropriate for all tasks. Go, as a general purpose language, is a mixture of decisions and tradeoffs that place it in the best position to reach and be relevant to mainstream developers. The choice of a garbage collected runtime was obvious for a language that held concurrency as one of its core tenets. Looking at the origins of Java, Python, C++, Scala, with the notable exception of Ruby, Go follows the trend of having a strong corporate or academic benefactor. Google are generous and passionate supporters of Go, and while the Authors work for Google, there are many external contributors who have made substantial ongoing contributions to the language. Just as importantly, the entire project is BSD licensed (something which D was not able to do, and suffered for it) and driven by passionate, opinionated leaders. To my mind, this is the best of both worlds. I think of this as a courtesy to people who already have an investment in an existing mainstream language. The syntax of Go is spartan, and takes little opportunity to further this area of language design, instead leaving that to Scala or Haskell. Go’s most powerful claims in this area would be the adoption of the go fmt source code formatting tool and the elision of semicolons, both of which have a subtle, but profound impact. Go answers Yegge’s call by providing a static language with dynamic typing features through the pervasive use of interfaces and automatic type deduction. For workloads which have at least some IO component, Go is as fast as Java or C++. It produces efficient, statically compiled programs that can be deployed trivially without the overhead of a large runtime framework. Go programs perform as fast on their first cycle as their last, without the need for witchcraft often associated with languages targeting a JITed interpretor. While it may not be possible, because of Go’s more conservative approach to pointer arithmetic and memory safety, to best the raw computational speed of C, performance is a core design goal of the language and will continue to improve over time. Even now, I have no hesitation in recommending Go to displace any programming task which would previously have been targeted towards Java. By comparison with Eclipse or Visual Studio, the automated tools available to Go programmers are limited. Taking the age of the language into account, this is to be expected. Interestingly for authors of Go programs, the experience is more akin to their dynamic cousins like Python and Ruby, who bucked the trend years before by adopting simple programming environments that offered little more than syntax highlighting. I’ll move quickly through Yegges list of must have features as their discussion would span several posts alone. The final tally is 11 affirmative, 7 negative, but with the addition of items from the next paragraph, specifically threading and continuations, I believe Go answers many of the import must haves for a mainstream language entrant. While languages like Julia or Rust approach 100% coverage of Yegge’s laundry list, it is still to be seen if they will achieve mainstream adoption. Go provides outstanding cross operating system and cross architectural support. Rather than adopt Java’s lowest common denominator approach, Go allows both an escape hatch to access features specific to one platform, and a simple file name based conditional compilation system to provide platform specific implementations without having to resort to interfaces. Rereading Yegge’s essay five years after it was published, it is clear to me that even, as Yegge claimed, he had no knowledge of the ruminations of his colleagues, the stage was set for the Next Big Language. I believe that Go is a strong contender for the Next Big Language and I urge you to give it serious consideration. This entry was posted in Go on September 3, 2012 by Dave Cheney.